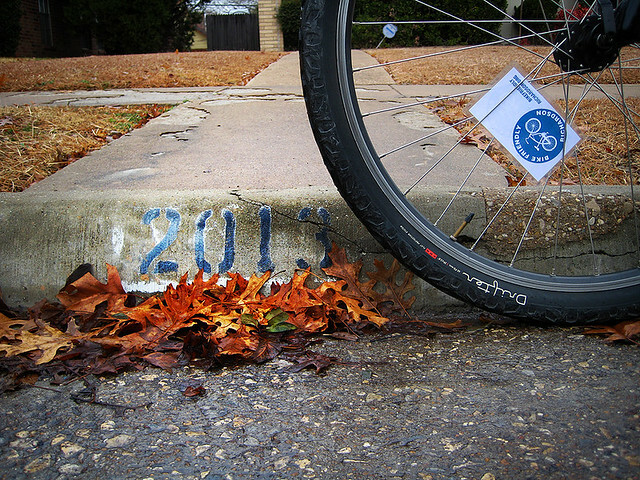 Happy New Year from your friends at Bike Friendly Richardson. We hope you had a safe start to the year and you get to enjoy many rides in 2013. Really great and creative pic of 2013 with bike & business card. That card is not installed properly. It’s supposed to be attached to the rear fork stay with a cloths pin so it can rub the spokes, and make motorbike sounds..
Hahaha! That was the standard mod when I was a kid. That and cutting off forks from junk bikes and adding them to ours to turn them into choppers.